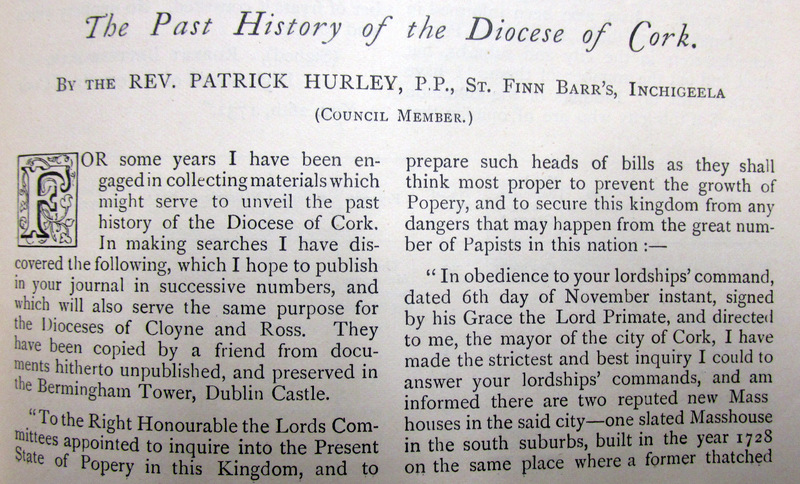 Report on Popery, 1731 setting out Masshouses and Popish Schools in Co. Cork, Drinagh, Inchigeela 7 sheds, Killaconenagh (Castletownbere) swarms of Priests are constantly going to and from France, 600 families in Parish of whom 12 are of Reformed Church, , Kilmoe (Ballydehob), Friars frequently landing from France and dispersing throughout the country, copied from documents in Bermingham Tower, Dublin Castle probably destroyed in 1922. 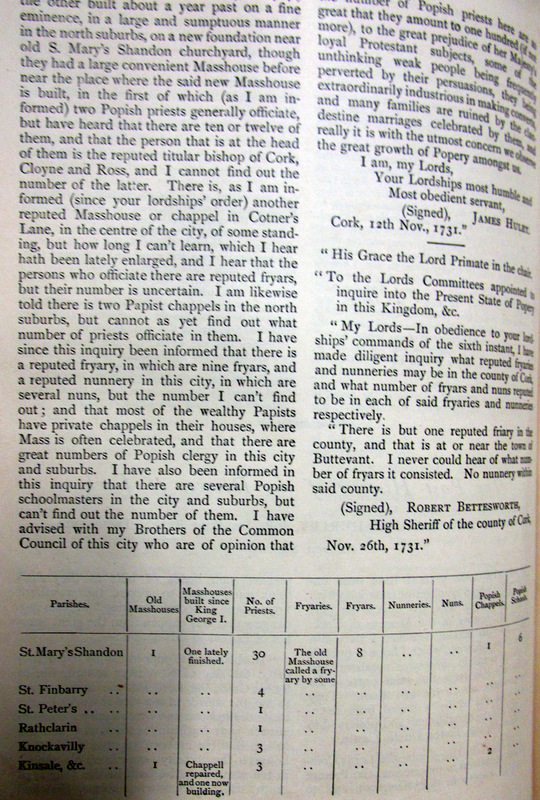 Report on Popery, 1731 setting out Masshouses and Popish Schools in Co. Cork, Drinagh, Inchigeela 7 sheds, Killaconenagh (Castletownbere) swarms of Priests are constantly going to and from France, 600 families in Parish of whom 12 are of Reformed Church, Kilmoe (Ballydehob), Friars frequently landing from France and dispersing throughout the country, copied from documents in Bermingham Tower, Dublin Castle probably destroyed in 1922. The Bermingham Tower was the precursor of the Public Records Office in the Four Courts the course of much adverse comment in the 18th and 19th century for neglect, dampness, rats eating records. The replacement PRO was widely admired at the time for its modern design, blown up by ‘Patriots’ in 1922. In assessing the Penal Laws it is worth bearing in mind that in France broadly similar laws were passed but with the exception that they were applied to their own people the Huguenots. In Ireland’s case they were imposed by an alien invading power. Bt 1750 the worst was probably over but legal disabilities on holding land or having professional qualifications remained until the 1770s onwards. Perversely the Penal Laws contributed to the development of a very wealthy Catholic Mercantile Class. 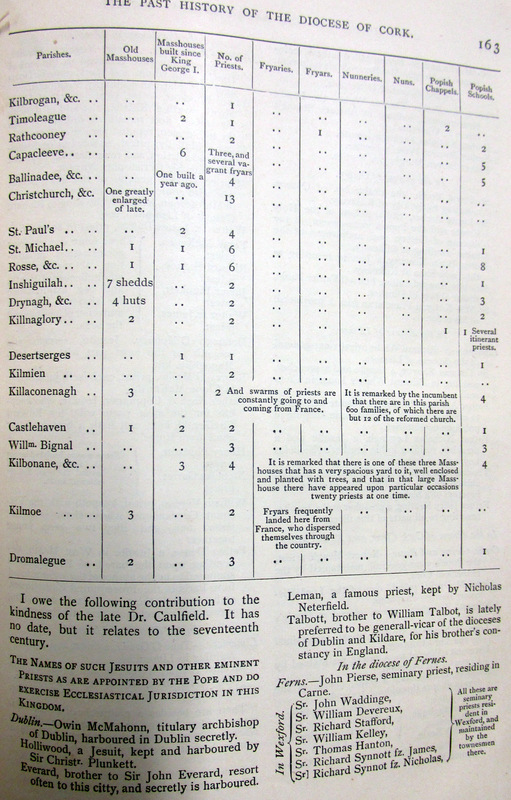 In Daniel O’Connell’s evidence in 1828 to a Commons Select Committee in 1828 a few months before he was elected an MP he said that Catholics were the majority shareholders in the Bank of Ireland and held most of the money on deposit. This is reflected in the newspaper of the time commenting on the births marriages and deaths of such families. Courtesy JCHAS 1892. The article refers to counties other then Cork. Interesting times. My gt (x4) grandfather Paul Limrick was Vicar and Rector of Kilmoe and Schull (1722-55) at this time. One of his sons, Robert, married a catholic and was probably the ancestor of the many (RC) Limericks living in both East and West Schull parishes during the 18th and 19th centuries.